Be it tubs or showers both can be dangerous to people of all age. While you are heading to your bathroom, there are chances to slip on and fall. And these are certainly some predictable hazards that wait to occur. Moreover, even if you slip, it will take some significant time to recover from a fall and for older adults, it might get impossible for them. So what is a walk-in tub? Who Are Step-In Tubs Designed For? How Are They Different From Standard Bathtubs? Can you lie down in a walk-in tub? Is bathing safely a concern? What is the water capacity for smaller and larger walk-in tubs? How long does a walk-in tub take to fill and empty? How is Electrical Installation Completed for Walk-In Tubs? What size water heater would you need for walk-in tubs? Since bathrooms have some of the major falling threats for older adults, they should come up with something that will reduce the chance of such hazards. However, hazards from the slipping near the edges of tubs are one of the most common accidents that might take place. Climbing over a the high edges to get into the water requires strength and sense of balance that becomes compromised with age. For this, special units have been built so that older adults can have a safe time bathing. So here are some common questions that we will be answering so you can get to know more about the walk in tub pros and cons. A walk-in tub is a bath tub that’s usually used for the same purpose as you would use a standard bathtub. It is, however, built to offer you a safer, more comfortable and convenient bathing experience. Walk-in tubs are generally meant to suit people with mobility problems like those who are older adults, or disabled (physical handicapped), or those who suffer from painful conditions. Who Are Walk-In Bathtubs Designed For? They were designed to meet the needs of people who want to bath securely and independently. Some individuals buy accessories for their traditional bathtub like grab bars, bath seats, etc. so that they can try and encounter their desire for security and independence while bathing. But then again, those Band-Aid type solutions aren’t really a solution at all. Thus, standard bathtubs, even with all the accessories are not built for those who have mobility challenges. And that’s where the need for a step in tub can be a necessity. Walk-in bathtubs also come with some extra features that typically don't come with a standard tub. For instance, a standard bathtub can be 20 inches or higher from the floor of bathroom that can be a hindrance for you. But with the walk-in version, it will provide a V or U shaped door that will open so that you can easily walk in (that’s where it’s name comes from) rather than having to climb to get into and out of the bathtub. These sturdy doors are sealed all over so they are watertight, this will prevent them from leaking and usually come in right or left-hand configurations so that it can meet the particular needs of an individual. You can use a walk-in bathtub, with its definite design and its extra options and features for other purposes as well. For instance, walk-in tubs typically offer a Jacuzzi or whirlpool option that puts air bubbles and/or jet right at your fingertips so that you can use it for comfort, relaxation helping to soothe pains and aches. Moreover, as a they are usually bigger and deeper, they offer more immersive bath. You will find in most cases, you can use for showering and bathing as well. Safety is a key design in a walk-in tub. Some of the safety features involve a grab or handlebar so that you can maneuver around, a chair-height seat so that you can have a secure and comfortable bath, and a non-skid floor so that it can prevent you from slipping and falling. They are generally made for safety since bathroom safety is an important factor as well. In fact, you can actually enhance the safety of your bathroom. One of the main features to claim it as safe is its low step-in height. You will find several accidents that are caused by the high step in height of a traditional bathtub. Stepping up more than 7 inches to get into the can be a bit straining and with a wet floor dangerous. That’s why they were created. They have about 2 inches or less step in height depending on which bathtub you use. Most styles also come with handlebars that have been fitted strategically to give you a support when you need it. They are designed with anti-slip features so that they can give you sufficient support. And yes they are low enough to access easily. The units comes with watertight doors. So when you close the door, it gets sealed entirely. And it’s highly leak proof; the water will not leak. All these safety features help keep the bathroom safe. Basically, they are a specially designed tub almost used in the same way like you use a traditional one. It’s a big basin that fills up with hot water, allowing you to immerse. The main difference is that walk-in tubs have a door that opens allowing users to step to walk in. The door into the bathing area is entirely sealed still allowing easy access when opened. You must to close the door before filling the unit to prevent spills. It means that you have to get into the tub before turning the water on and can only come out after all the water gets drained. The walk-in tubs work just like other traditional bathtubs where you can sit down and bath or even you can stand up and take a shower. So, if people have no mobility challenges, disabilities or arthritis issues, they can certainly lie down and enjoy a comfortable bathing experience. Keep in mind if you choose a smaller model it may not have the space to lie down. Having a safe bath is absolutely important for the people of all ages. As the bathroom has many opportunities for accidents, it’s important that you increase the safety level of bathroom as well as bathing. It not only prevents you from all the accidents but also gives you a great bathing experience as well. And walk-in bathtub maximizes your ability to bath safely and independently. Typically, a small bathtub will hold about 40 gallons of water while larger walk-in bathtubs will hold about 80 gallons. It will completely differ on the basis on the size of the walk-in tub, your faucet and your body and how much it water it displaces. It is quite an easy process to figure out the drain time and fill time of your tub. Just, use your current tub faucet, fill a 5-gallon bucket with water and check out how long it’s taking. Then you will need to multiply it by the number of gallons that your bathtub holds and then divide by 5 (for the 5-gallon bucket). And then you will need to subtract the number of gallons of water that your body displaces. Usually, one gallon of water gets displaced per 10 pounds of body weight. Thus, if your weight is 150-pound then your body displaces about 15 gallons of water. Electrical connection is made via plugging each cord into the GFCI outlet. Run 1 to 3 branch circuits from the main electrical service panel to the pump region for providing power to the unit. However, electrical components contain particular wiring requirements. Branch circuits must be rated for 110 to 120-volt. 12 Gauge, 3 conductor cables should be used for the circuits. We highly recommend having a professional electrician handle wiring. The tank of the water heater has to be about 2/3 the size of bathtub. If you own a water heater of 40 gallons of water, it will be large enough for a 60 gallon tub. A small tub may hold 40 gallons of water heater while a larger tub can easily hold 100 gallons of water heater or more. However, a 40 to 50-gallon water heater is quite sufficient for a standard sized walk-in tub. You will find many manufacturers who are kind enough to provide more than just one size. This gives you the chance of choices based on your personal preference. Another good thing is, almost all of the sizes will fit into a standard bathtub space, in case if you are not sure about the space of your bathroom. You might know that space for a standard bathtub is usually about 60 inches long and 30 to 32 inches wide. You can purchase a walk-in tub that is bigger than a standard tub and also tubs that are small enough to fit into a shower stall. The majority of walk-in bathtubs are a bit deeper than a standard bathtub. 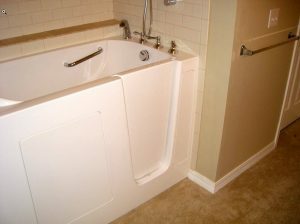 Some walk in bathtubs are designed so that they can be sealed into the area similar to a standard tub. There are also other manufacturers that provide a more temporary free-standing walk-in bathtub that you can move or remove but at a later time. So here we’ll be discussing about the size and dimensions of all the walk-in bathtubs out there. The largest walk-in bathtub is about 60 inches long and 32 inches wide. It is the longest and deepest bathtub available in walk-in tub market that gives you the utmost room and utmost immersive bathing. It generally provides the biggest door opening and is best for standing and showering. Not only that, it is also best suited for bigger bathers. It also has the biggest water capacity while still fitting into the typical 60 inches standard bathtub opening. The mid-ranged dimension walk-in bathtubs are ideal for a typical user. It contains less water capacity than the largest one, yet it provides a great immersive bathing experience. Not only that, it also fits into the standard 60 inches opening. You can also purchase an optional extender kit, that will fill in any extra gaps or spaces between the bathtub and your bathroom wall, while you order a shorter model tub. The smaller walk in bathtubs are best for constricted spaces and petite people. The manufacturer still offers a more immersive bathing experience than a standard bathtub. But it will have lesser water capacity than the mid-ranged and largest walk in bathtubs. However, the tub will also fit into the standard 60 inches opening and you have the option for bathtub extender kit for space fills. The smallest walk in bathtub is about 36 inches long and 33 inches wide. Yet, it also offers you the benefits and features that the larger one provides while still being capable of fitting into even the smallest bathroom space available. You will find many sizes in the range counting 51 inches by 30 inches, 51 inches by 26 inches, and 48 inches by 28 inches. So whatever size you go for your bathroom, you will find that almost all the sizes have dimensions nearly of a standard bathtub that come with extra features like the watertight door, grab bar, non-skid floor, chair height seat and deeper soaking dimensions that you will not get from a standard bathtub. Walk-in tubs are solely for the people who are looking for a safe, cozy and independent bath. Hope, these answers help you solve your questions. Walk-In Tubs Covered by Medicare? Call us today to learn how you can have a walk-in tub professionally installed in your home.